All public streams, lakes and ponds are open to fishing throughout the year except some state-owned and managed Public Fishing Lakes (PFL). It is illegal to fish in public waters on or from posted private land without the owner’s permission. It is illegal to fish in private waters without permission from the owners. It is illegal to take, catch or kill, or attempt to take, catch or kill any game fish by any means other than ordinary hook and line, artificial lure, live bait, troll or spinner in any of the public waters of this State. It is ­unlawful to use electrical devices, explosives, poisons or firearms to take fish of any species from these waters. The following shall be named and designated as game fish in Alabama: rainbow trout, all members of the sunfish family to include: largemouth, smallmouth, spotted, shoal, and those species formerly known as “redeye” bass, which are now known separately as Coosa, Warrior, Cahaba, Tallapoosa, and Chattahoochee bass, based on their respective drainages and the Alabama bass which was formerly known as spotted bass in the Mobile drainage; those fish commonly referred to as bream which include rock bass, flier, shadow bass, warmouth, redbreast, bluegill, longear, and redear (shellcracker); black and white crappie; all members of the temperate bass family to include: saltwater striped, white, and yellow bass and any hybrids thereof; all members of the pike family to include chain, redfin, and grass pickerel; the following members of the perch family: sauger (jack), walleye, and yellow perch. BAIT is a voluntary partnership between bass clubs and the Alabama Division of Wildlife and Freshwater Fisheries (ADWFF). The program summarizes information on bass fishing and is used by ADWFF fisheries biologists, in combination with their reservoir surveys, as the basis for fisheries management decisions. BAIT data allows biologists to identify trends in bass populations and helps them better understand the mechanisms that influence them. This data may also be used by participating bass clubs to select tournament locations. Following a tournament, a club member fills out a data form that provides details regarding the tournament format, the number of participants, and the numbers and weight of bass weighed-in. The results are then compiled and analyzed for each Alabama reservoir and an annual report is published. The report ranks each reservoir based on five fishing quality indicators and determines an overall ranking. In order to assist in the BAIT process, tell your fellow club members and tournament directors their participation is needed. If your club is already participating in this program, we thank you for your continued support. If your club is not participating, but would like to, simply complete and submit a BAIT card following each tournament. All participating clubs receive a printed copy of the annual report. For more info, contact the Fisheries Section at (334) 242-3471, email Kyle.Bolton@dcnr.alabama.gov or visit www.outdooralabama.com/bass-fishing-quality-bait-reports. Alabama’s Angler Recognition Program is intended to honor individuals who catch large sportfish from Alabama waters and to provide biologists with useful statistics on the number of large fish caught from our reservoirs. The program includes four categories: Master Angler, Trophy Angler, Lake Record and State Record. Anglers can submit applications for Master Angler and Trophy Angler status based upon their fish’s total length or total weight, but not both, and may submit an unlimited number of applications. Applications, specific requirements, and instructions can be obtained from any District Fisheries office or from www.outdooralabama.com/freshwater-fishing/state-record-angler-recognition. Qualified anglers will receive a certificate commemorating their catch and a window decal. Detailed information on creel and possession limits and size limits is provided on Fishing Daily Creel, Possession & Size Limits. Please familiarize yourself thoroughly with this information. You should also notice that size limits for the various fish species are not the same on all public waters. Be sure and check this information for each body of water you plan to fish. 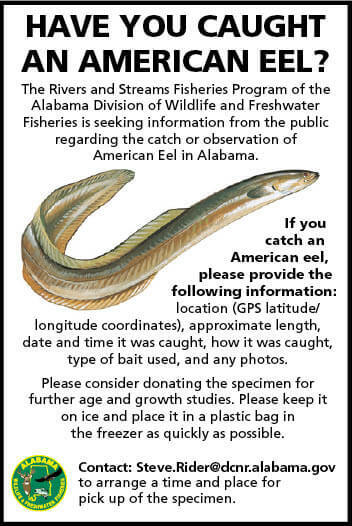 Should you have questions, you may ­contact any Wildlife & Freshwater Fisheries Division Fisheries Biologist or Conservation Enforcement Officer or call (334) 242-3471 for assistance. All species of bream may be used as bait as long as a person does not have in his ­possession total bream numbers in excess of the daily creel limit, regardless of size, and they are ­harvested legally. Other native game fish may not be used for bait. It is unlawful to sell or purchase any game fish from Alabama or in Alabama from another state except (1) game fish raised in hatcheries and sold for stocking ponds and lakes; (2) non-native game fish (trout, salmon, etc.) raised for human consumption or (3) largemouth bass, shellcracker, yellow perch and bluegill bream raised in farm ponds, which may be sold under permit from the Wildlife & Freshwater Fisheries Division. For more information, contact your local District Office (Wildlife & Freshwater Fisheries District Offices). It is illegal to fish trotline or snag line, set line, commercial fishing net, slat boxes or wire baskets within one-half mile below any lock, dam or powerhouse. All recreational licensed fisherman utilizing trotlines are limited to 100 hooks total. All trotlines must have a plastic or metal tag attached containing the owners name and either their address, fishing license number or phone number. Trotlines operated under commercial fishing licenses are not limited in number of hooks. Wire baskets may be used only in certain counties to harvest nongame fish for personal ­consumption only. Persons holding a ­commercial fishing license may not fish with wire ­baskets. No fish taken in wire baskets may be sold or offered for sale. All game fish taken in the ­baskets must be immediately returned to the water. All baskets must be clearly marked with the valid wire basket license number and name of person using and owning the basket. It is illegal for any one person to fish with more than four wire baskets. Consult the Wildlife & Freshwater Fisheries Regulation Book or local Conservation Enforcement Officer (see District Offices, Wildlife & Freshwater Fisheries District Offices) to determine number of baskets and locations where wire baskets are legal. Commercial or nongame fish may be ­legally taken by gigs or by grabbling by hand by ­persons possessing a valid sport fishing license. It is unlawful to fillet a fish or remove heads while fishing or to possess fillets of fish while on public waters, except when fish are being prepared for immediate cooking and consumption; ­provided, ­however, that the fish may be drawn or gutted with heads left attached. The spearing of nongame or commercial fish solely for the purpose of sport in all waters of this state, both fresh and salt, is legal provided that the person engaged in the act of ­spearing is completely submerged and ­possesses the appropriate sport fishing and spearfishing licenses. This license is issued by the Wildlife & Freshwater Fisheries Division, Marine Resources Division and online. 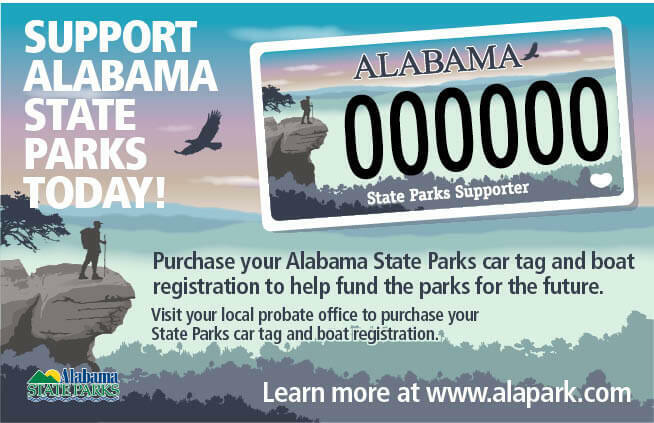 For more information and application packet, call (334) 242-3465 or visit our website at www.outdooralabama.com. It is unlawful to take fish by snagging on the Chattahoochee River or its impoundments, the Tennessee River or its impoundments, and State-owned public fishing lakes. Further, it is unlawful to take or attempt to take fish by snagging within 800 feet of any dam on the Coosa River or its impoundments. Bow fishing with any longbow, recurve bow, compound bow or crossbow using barbed arrows attached by line to the bow, float, vessel or shooter is legal for the taking of commercial or non-game fish. It is legal for licensed anglers to take minnows, shad, and certain suckers from certain public waters by the use of a cast net, minnow jug, minnow basket, not to exceed 24 inches in length, 12 inches in ­diameter, with funnel entrance not more than one inch in diameter, dip net or minnow seine, the length of which shall not exceed 25 feet and the width or depth of which shall not exceed 4 feet for the purpose of taking shad or minnows for the exclusive use as fish bait. No seines may be used in un-impounded tributary streams and creeks. All game fish and all commercial or nongame fish taken by nets or seines must be immediately returned to the water from whence they came with the least possible injury. Dip nets may be used to land legally caught fish. Licensed anglers may use their hands, a rake or dip net not wider than 24 inches to collect the Asiatic Clam Corbicula for fish bait. The zebra mussel is an exotic species of freshwater mussel that has colonized many southern bodies of water, including the Tennessee River system. These mussels can disrupt freshwater food chains and may cause major changes in some fish populations. Boaters are one of the major contributors to the spread of zebra mussels from infested to uninfested waters. To report zebra mussel sightings or for more information, contact: Alabama Dept. of Conservation and Natural Resources, Wildlife & Freshwater Fisheries Division at (334) 242-3471. It shall be unlawful to intentionally stock or release any fish, mussel, snail, crayfish or their embryos, including bait fish, into the public waters of Alabama under the jurisdiction of the Division of Wildlife and Freshwater Fisheries as provided in Rule 220-2-.42 except those waters from which it came without the written permission of a designated employee of the Department of Conservation and Natural Resources authorized by the Director of the Division of Wildlife and Freshwater Fisheries to issue such permit. The provisions of this rule shall not apply to the incidental release of bait into the water during the normal process of fishing. It is unlawful for any person to operate any vessel on the waters of Alabama within 800 feet below a hydroelectric dam and/or navigation lock and dam unless each person aboard, including the operator, is wearing a securely fastened U.S. Coast Guard approved personal flotation device Type I, II, III or V.
Public access areas include state-owned and/or operated boat launching ramps, ­associated parking lots, piers and any real or personal property within the boundaries of such areas. Such public access areas are for the uses of pleasure boating, hunting and fishing. Picnicking is allowed only where tables are provided. The following is a synopsis of regulations for use of such areas, and is intended as a general guide for the boating public. Please refer to the Wildlife & Freshwater Fisheries Regulation Book for specific interpretation. Operate any unlicensed vehicle such as ATVs, except those driven by mobility impaired persons in accordance with the Americans with Disabilities Act. Operate commercial, industrial or construction equipment such as barges without written approval obtained from the Fisheries Section, 64 N. Union St., Suite 551, Montgomery, AL 36104. All other state laws apply and are enforced on public access areas. Boating access information is available online at: www.outdooralabama.com. This pamphlet covers only freshwater sport fishing laws and regulations. For information on freshwater commercial fishing or musseling, visit our website at www.outdooralabama.com, call (334) 242-3465 or visit the nearest District Office (Wildlife & Freshwater Fisheries District Offices). In 1995, a major initiative to bring fishing opportunities to urban dwellers became a ­reality when the Division launched the Community Fishing Program in cooperation with Alabama municipalities. Recognizing the shift in population from rural to urban areas, the program ­promotes fishing as wholesome fun for youth in Alabama cities and towns. From small ­communities to sprawling metropolitan areas, towns and cities throughout the State are all ­eligible to participate. The Division partners with local communities or civic groups. The Division provides expertise, block off nets and loaner tackle. Communities and/or civic groups provide a ­location, volunteers and fish. The result is a lot of fun for ­everyone. Community events ­attracting participants are proof of the success of this program. To learn how to have a ­community fishing event in your community, contact your local district fisheries supervisor or Doug Darr, Fisheries Section, 64 N. Union Street, Montgomery, AL 36104, (334) 242-3884. Our web address is www.outdooralabama.com. The Roberson-Archer Act and The Boating Safety Enhancement Act of 2001 mandates that no one under the age of 12 may operate a motorized vessel, and that every vessel operator be licensed and have the license in possession at the time of operation. For information on obtaining a vessel operator’s license, contact the ALEA Marine Trooper Division at (334) 517-2930, or visit www.outdooralabama.com and click on Boating. Must be 12 years old or older, but cannot operate alone until the age of 14. Operators 12 or 13 years old, after obtaining the vessel operator’s license, can only operate if an adult 21 years old or older with a vessel operator’s license in possession, is onboard and seated in a ­position to take immediate control of the vessel if necessary. A licensed operator, 14 years old or older, may legally operate without supervision. Possession of a certificate of completion for a boating course is not a vessel license. Nonresidents 12 years old and older, may operate on Alabama waters up to 45 days per calendar year without obtaining a vessel operator’s license. However, operators 12 or 13 years old, can only operate if an adult 21 years old or older who either has a vessel operator’s license in possession or who falls under the 45 day exemption period, is onboard and seated in a ­position to take immediate control of the vessel if necessary. If operating a vessel for more than 45 days, the nonresident must get an Alabama Nonresident Vessel Operator’s License. ­Nonresidents who have obtained a vessel certification or license from their home state, may use that in lieu of the Alabama Nonresident Vessel Operator’s License. For information on saltwater fishing license requirements, size and possession limits, ­contact the Marine Resources Division, PO Drawer 458, Gulf Shores, AL 36547, (251) 968-7576. Ponds provide more fishing opportunities than most types of waters in Alabama. Alabamians utilizing ponds for fishing provide needed funding for sport fish restoration. There are more than 275,000 fish ponds in Alabama. Manmade fish ponds greatly alleviate the fishing pressure on our public streams and lakes. Therefore, the Wildlife & Freshwater Fisheries Division is vitally interested in this popular resource. Proper stocking and ­management will provide years of excellent fishing for bass, bluegill and shellcracker. Sustaining good fishing in ponds requires proper design, stocking with appropriate fish species and ongoing fish management. Ponds should be thought of as gardens because all the basic gardening principles also apply to pond management. Technical assistance is also provided to pond owners at no cost regarding proper ­management practices such as fertilization, liming, weed control and fish harvest. These ­management practices are essential to maintaining good fishing in ponds. In particular, ­proper fertilization results in an abundant food supply for bass and bream, ensuring that they will be abundant and in good condition. Contact a Wildlife & Freshwater Fisheries Division Office for assistance (Wildlife & Freshwater Fisheries District Offices). Many of our rivers, lakes, and coastal areas are experiencing algae blooms that cover our favorite fishing spots with green slime and cause fish kills and “dead zones” where no aquatic life can survive. The cause is usually nitrogen and phosphorus pollution that comes from farm and lawn fertilizers, septic systems, animal waste, and sewage treatment plants. Everyone can do their part for clean water by reducing fertilizer use, preserving plants along shorelines, and picking up pet waste. Supporting water quality protection supports great fishing! It is prohibited to introduce, place or cause the introduction or placement of any non-native aquatic plant into any public waters of the State. For further information, contact the local District Fisheries Biologist (see Wildlife & Freshwater Fisheries District Offices). Fish from most waters in Alabama are safe for human consumption. For those locations of concern, fish consumption advisories are provided by the Alabama Department of Public Health. For a current list of advisories call: (800) 201-8208 or visit www.adph.org.